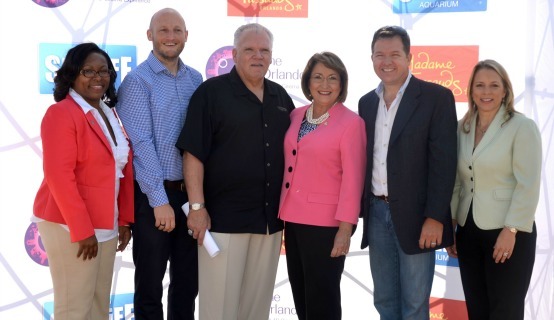 Orange County Mayor Teresa Jacobs recently provided the opening remarks at a media event hosted by Merlin Entertainments Group Plc. The event provided an early look at the $200 million project now under construction on International Drive. Merlin Entertainments also announced the official project name, I-Drive 360, and its targeted opening date of spring 2015. I-Drive 360 will be home to three headlining attractions—the Orlando Eye observation wheel, Madame Tussauds Orlando Wax Museum and the Sea Life Orlando Aquarium. The Orlando Eye, constructed by a Swiss company, will be the tallest observation wheel on the East Coast and will be the centerpiece of the I-Drive 360 complex. At 425 feet, guests will ride in air conditioned capsules as they slowly make their way around the wheel. The wheel assembly is slated to begin in June. According to Unicorp President Chuck Whittall, the project could be ready for a grand opening in March 2015. I-Drive 360 will afford the corridor with a new venue for large, open-air events. Corporations looking to have post-convention gatherings will have an opportunity to host parties with the three attractions as a backdrop. A Merlin Entertainments annual pass will not only provide access to the three I-Drive 360 attractions, but also to the LEGOLAND Florida parks. Additionally, a shuttle that currently takes guests from the Orlando Premium Outlets-International Drive will later move to the I-Drive 360 site behind the Orlando Eye, offering guests in the convention area an opportunity to add that experience to their trip. Photos from the media event are available for use by the media and are located on Flickr.